I don't think we're in Kansas anymore Toto. Even Captain Kirk has been passed on the technology highway. The age of touchscreen technology is here and enhancing the way we communicate, educate and conduct business. As the screens become thinner, their size is increasing, making the placement of the screens easier and more available. Users have the ability to interact with the screen without actually touching it - just like they do on NCIS! At Shanahan Sound, we assist schools, organizations and businesses by designing and installing the latest touchscreen technology including digital projectors, audio systems, interactive whiteboards and digital signage. This web-based system can host a single display or expand to almost limitless channels in multiple buildings. Here are some of the benefits of touchscreen technology. 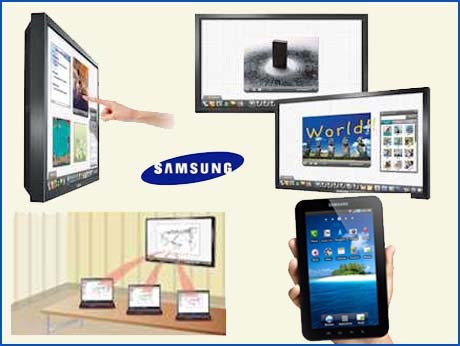 The development of smartphones and consumer tablets like the iPad, and Samsung Galaxy tablet among others have driven touchscreens into the main stream. As content management is further developed, there will soon be a seamless crossover between mobile, web and signage. From a cost structure, low-end screens will make it possible for this technology to become omnipresent in the future. Shanahan Sound is an authorized seller of Tightrope Media's Carousel, a digital signage solution. To learn more about Touchscreen technology, give us a call at 800-786-1556 or contact us today. One of our professionals will be happy to work with you.